And now for something completely different: Symbol Stones! For followers of these pages, you have probably come to see that "Alchemy Stones" are primarily works of exceptional accuracy and detail. I have always been fascinated by nature and detailed patterns-- when I was a kid, the Spirograph was my favorite toy. When my father gave me my first "serious" camera-- for my 16th birthday-- my interest was not in taking pictures of parties or sweeping vistas... but in trying to photograph the tiny patterns found in the seed settings of a sunflower, or in old fossils in rocks. But sometimes, all this detail and precision does get to be a little too much! 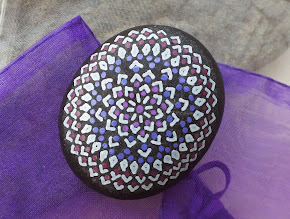 So what happens when a rock painter basically "flips out" and wants to do something more free form? I am not sure what-- if anything-- they "mean," but they are unusual and colorful... and because I can make them fairly quickly, they are also fairly inexpensive, at just $3.00 each or $25 for 10. 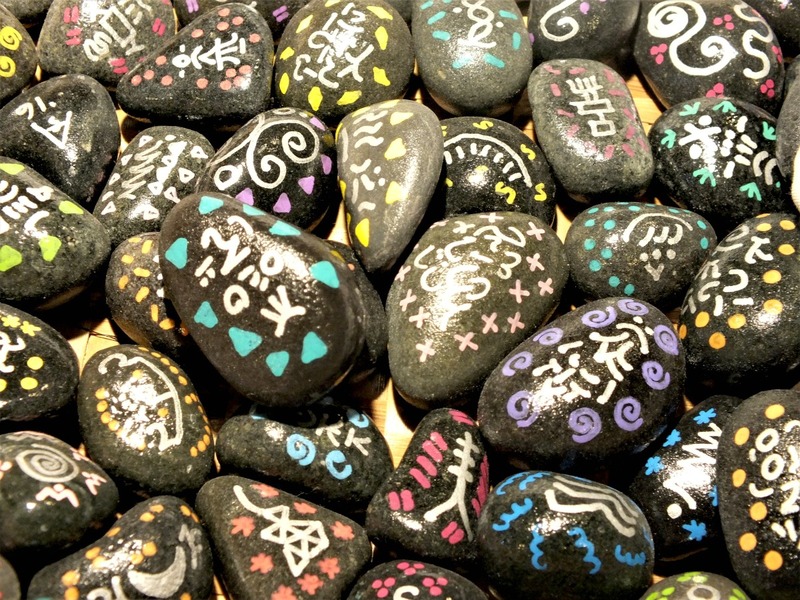 I haven't previously written about them because they have not been available through our web shops-- only "in person" when we went to fairs and festivals-- but now that we have the Red Dragonfly Gallery here in Port Townsend, they can be found as a permanent part of the Alchemy Stones selection there. In the future, I hope to add them to our web shops, as well!